For some reason, tourism in Rome is proving the (supposedly) ongoing economic crisis as some sort of a hoax.As it is, these days Rome is abounding with tourists mainly from scandinavian and neighbouring countries like Germany. Obviously, many tourists worldwide prefer ROme as their travel destination. One of the inevitable parts of travelling to a foreign country is looking for a good, safe, quality and cheap accomodation. 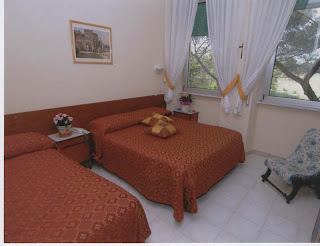 MAdre SerafinaVacation HOuse Casa(per Ferie) Madre Serafina is a very ideal choice of accommodation mainly because their rate/night is much lower than standard Rome hotels. It is but a few minutes from the Rome downtown area. It has a very convenient location- far enough from the hustle and bustle of a metropolitan area yet, very accessible to major destinations (like shopping, dining, parks and tourist spots etc.) You can also attend their religious services since this is also a religious house of nuns. Our pastor-friend who visits Rome annually to participate in his mission-church's anniversary celebrations, stays there everytime. And he is satisfied with everything, the price, the accessibility, the hospitality, cleanliness and security. This information serves those who need Cheap Rome Accommodation.